The ICCA Consortium Members, partners, and friends of West and Central Asia and the Caucasus gathered in Bishkek, Kyrgyzstan, from 29-31 October 2018. This meeting was a “pre-regional assembly” that gave Members an opportunity to plan preliminary lines of organisation and work within the region. The meeting was co-organized by the ICCA Consortium and the Mountain Societies Research Institute of the University of Central Asia (MSRI/UCA). 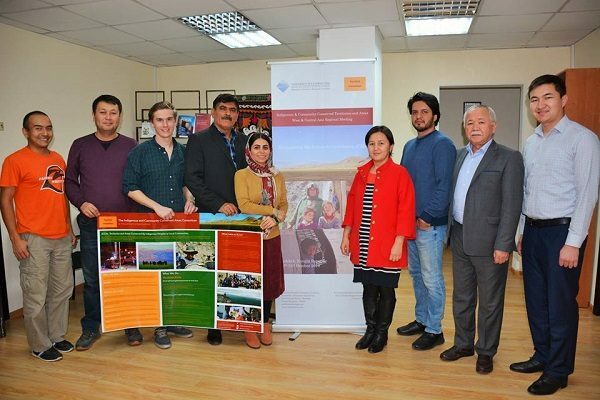 A primary goal was to raise awareness of ICCAs in the Kyrgyz Republic and in West and Central Asia by identifying emblematic ICCAs and finding ways to support them in ‘self-strengthening’ and building partnerships. Marc Foggin, the Acting Director of MSRI and Honorary member of the ICCA Consortium, welcomed the participants and expressed his appreciation to the delegation of the Centre for Sustainable Development and Environment (CENESTA) from Iran: Ghanimat Azhdari, ICCA Consortium Council member, and Ali Razmkhah, regional Coordinator. Highlighting the importance of ICCAs, Mr. Foggin noted that approximately one quarter of the world’s land area is owned, used, and/or managed by indigenous peoples, mostly outside of protected areas. The ICCA Consortium members spoke about the range of groups and peoples included in the term “ICCA”, as well as its mission and activities. They gave examples of shared experiences in advocacy for ICCAs in Iran. Meeting in workshops, the participants addressed the main relevant issues for ICCAs in West and Central Asia. Using an analysis of Strengths, Weaknesses, Opportunities, Threats, participants identified possible challenges and opportunities for capacity-building of emblematic ICCAs, options for enhancing legal and policy recognition of multiple values of ICCAs, and for outreach and building partnerships with local communities in the region. A following Regional Assembly is planned in Armenia in early 2019.